John A. Bujnowski, age 98, of Bayonne, entered into eternal rest on Sunday, June 24, 2018 at the Autumn Lake Healthcare at Berkley Heights, surrounded by his loving family. 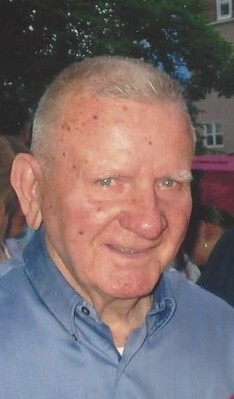 John was employed with the General Cable Corporation in Bayonne for many years prior to his retirement. He was an avid sports fan who enjoyed watching soccer, baseball, and football, especially his favorite team, the New York Giants. John also enjoyed trips to Atlantic City. He was predeceased by his beloved wife Ruth (nee: Whalen), in 1984 ; his parents, Vincent and Pauline (nee: Locwin); three sisters, Helen, Mary, and Bertha; and four brothers, Joseph, Stanley, Peter, and William. Left to cherish his memory are his daughter Linda VanEtten and husband Michael; five sons, John and wife Virginia, James and wife Rose, Thomas and wife Diane, Daniel and wife Alexandra; and Allan and wife Kimberly; grandchildren, Kerri Ann B. VanIperen and husband Peter, Krista, Eric, Dolores, Joseph, Sarah, Sean, Evan, Michael Noah, and Christian; one great-grandchild, Emerson Olivia VanIperen; and three brothers, Edward, Thomas, and Henry. A visitation will be held at the Dworzanski & Son Funeral Home on Thursday, June 28, from 4:00-8:00 pm. A funeral mass in John’s honor will be offered on Friday, June 29, at 10:00 am at St. John Paul II Parish at Our Lady of Mt. Carmel Church. Interment will follow at Hillside Cemetery, Scotch Plains, NJ. In lieu of flowers, donations may be made to St. Jude Children’s Research Hospital. Envelopes will be available at the funeral home.